What’s to Love: Rest assured, when I visit places like the Great Wolf Lodge (GWL), I talk with as many parents as possible – gathering valuable feedback to pass along to my readers. On this visit, I spoke to at least 15 parents, and not one person had a negative thing to say about their experience at the GWL. I even fed them some criticisms I had read online, and they all looked at me like I was crazy. I think that says a lot right there! The reality at the GWL is that parents and kids absolutely love this place. If you bring your family, I’m confident that you’ll all have the time of your lives. 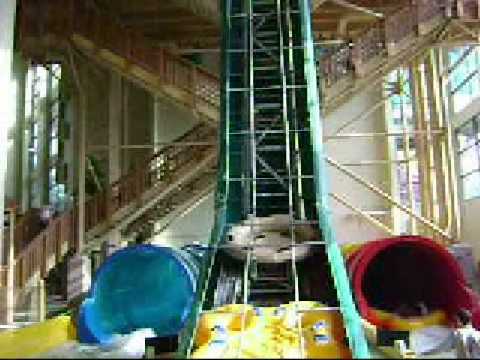 The Great Wolf Lodge in Grand Mound, WA is a great destination for Portland-area families. Bear Track Landing is an incredible, HUGE, indoor waterpark featuring a wave pool, kiddie area with slides, many exciting waterslides including the “Howling Tornado.” This is a full-service resort with theme rooms, restaurants, spa, kid areas, teen space, and much more! What’s to Love: Located about 2 hours east of Seattle with less rain, more sunshine, and a lifetime-worth of outdoor recreation, the small town of Leavenworth is the “Bend, Oregon” of Washington state. If that were not enough, Leavenworth is one of the most family-friendly towns I’ve ever visited. While gas is cheap, I highly recommend taking the family on a 5-hour drive for some exciting winter fun including (depending on your experience): snowshoeing, cross-country skiing, backcountry skiing, ice climbing, alpine climbing, downhill skiing, sledding, sleigh rides, snowmobiling, and some of the wildest tubing you’ll ever experience! Sure, you could just drive up to Mt. Hood; however, Leavenworth provides a small, Bavarian-style village that will make you feel like you’re on a trip in the alps (well…almost!). All the winter activities can be had right in town or within a 45 minute drive. This town provides a cozy, winter wonderland that you just can’t experience at larger destinations.